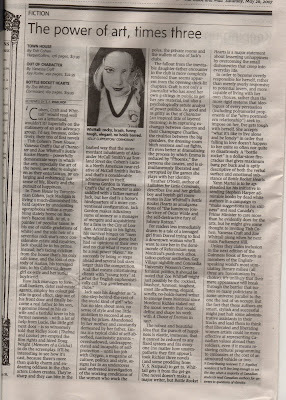 Zoe Whittall: GLOBE AND MAIL REVIEW!!! "Zoe Whittall might just possibly be the cockiest, brashest, funniest, toughest, most life-affirming, elegant, scruffy, no-holds-barred writer to emerge from Montreal since Mordecai Richler staked out the moral terrain that would define and shape his work with A Choice of Enemies in 1957." I can't read the full text because the globe and mail wants me to pay $4.95, although I couldn't get more glamorous than this blurb -- congratulations!